On November 18, 2018, the Third Gate Games crew returned to The Walt Disney Family Museum in San Francisco’s historic Presidio for the encore presentation of February’s event. Due to the poor air quality from wildfires to the east, the event kicked off in the downstairs area of the museum. Teams were split into groups and escorted into the museum’s two elevators on their way to five scattered starting locations. One of the unique rules for this game was that teams were only allowed to move forward in the museum, and could not backtrack any further than one gallery. This required a new approach to time management for teams, but after timing a stroll through the galleries at about five minutes, this was not considered to be a detriment to team performance. Once all teams were in place, the game started; teams grabbed their packets and found somewhere to sit and analyze their quests. For this event, teams were limited to two players. Game play lasted approximately four hours; once complete, teams turned in their answer sheets in the museum lobby. One of the first rules of good MouseAdventuring is to check the point value for each quest, and be strategic about how you tackle them. Normally a MouseAdventure quest packet is arranged in order from easy to hard quests. This game was arranged in the order that the quests could be found in the museum galleries. The quest instructed teams to “find the award for that organization and determine what they refer to Walt Disney as.” Once teams found the correct plaque, the first paragraph supplied the final answer. During the previous weekend of MouseAdventure at the Museum, this quest had different instructions and fewer words in the clues. It became clear that the changes made for the Rewind game resulted in greater players happiness. In Gallery 2a, teams found an exhibit of the Alice Comedies projected across a collection of six large display screens. Over the course of about 15 minutes, the displays feature 17 individual Alice titles, and a scrolling list of all the 57 of the productions. The challenge was to accurately record each of the 17 titles, then figure out how to arrange them in given spaces on the quest sheet. One word from each title had a number below, indicating the letter to use from that word for the final phrase. The instructions for this quest specifically stated to read in “the correct order,” which is MouseAdventure’s way of saying “not the order you would normally think of.” Once all the titles were in the order on the quest sheet, with the indicated letter pulled out, teams read emantsrifsrelkniw. However, if they read from the bottom of the page to the top, the phrase made more sense: Winkler’s first name. When writing this quest we were excited to discover that Walt’s first distributor in the 1920s was a woman. MJ Winkler’s name appears on almost all the movie posters featured on the six displays, but to determine what her first initial stands for, you had to look on the wall facing the displays to learn Margaret Winkler’s story and name. Walking into the multimedia nirvana of Gallery 3, teams were asked questions about the items found in almost every case in the room. 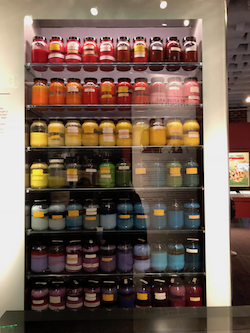 Once each question was answered correctly, teams then had to find the colored paint pots used to paint animation cells, and chart a path using their answers. Starting at Poppy, teams had 8 questions to follow along in order to reveal the correct final color. On to Galleries 5 & 6, where the Walt Disney Studio really gets going, only to be affected by strike, then wartime. Teams were given 14 sets to complete, using the exhibits in both galleries. After finding the missing words from each set, teams eliminated them from a word search grid to reveal the final question: Who would apperciate suggestions to improve our service? The quest instructions specifically called out that the question would involve an “unfamiliar spelling.” When teams looked back at the menu they had previously recovered the word “Sherbet” from, they found the typo, and Victor’s name. Teams also found multiple spellings of “Sherbert,” but we were only looking for the one from the menu. Moving into Gallery 9a, the most awesome train set in the world awaited MouseAdventurers. In addition, the title of this quest was a big clue about not using a piece of data that was not available during the first running of this event; the caboose was present all through writing and testing, but then went down to the the basement lobby as part of the museum’s annual Home for the Holidays display. It rejoined the rest of the train earlier in 2018, but the quest was not rewritten to include it. For the first part of this quest, teams scoured the informational signs in front of the train to locate all of the numbers and fractions that appeared in the text, then put them in order. 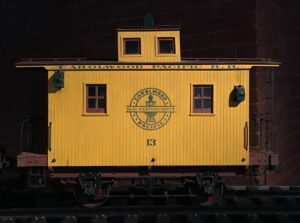 Those numbers provided the key to place the provided letters in order from their appropriate columns to construct the following sentence: Now decode using the numbers on each vehicle on the model train on display. Several people can be seen riding the miniature railway on the informational panels, and in the videos shown above the train. If teams looked closely at the car on display and compared it to the photos they could make out that Salvador Dali is the only person shown riding car number 734. Walking down the ramp from the Carolwood Pacific display, teams came across the museum’s amazing model of Walt Disney’s Disneyland. As explained by museum staff, it is an idealized model featuring everything that existed during Walt’s lifetime. Teams were looking for items across the model to answer a series of true/false questions, with each answer providing one of two sets of letters. When answered correctly and entered into the provided grid, the final question was: Number of boats on the Jungle Cruise. This quest required a good eye for detail both in surveying the model for information, and in reading the question correctly. It also came with stern warnings on the quest sheet to players: do not reach over the glass with pencils or clipboards. This game was designed with a buffer between each quest, so we took our Eye Spy pictures in the in-between galleries. Using a theme of transportation, teams had to find the picture or item that had something removed, and tell us what was missing. 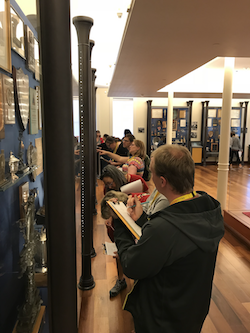 In order to involve the museum staff more in this game, teams were provided a keyword at rules presentation that they then had to provide to the ticket desk to receive 10 points. Any teams signing up for museum membership on the day of the event were offered an extension on the usual membership term of one year. The subject of trivia can sometimes be a little divisive in the MouseAdventure forums. Some teams have welcomed the change from 2 points to 1 point per question. Sometimes the winner of the game comes down to trivia scores. On the Saturday game, we had a 4-way tie without trivia. After adding the trivia scores, we had a 2-way tie, which was then broken by turn-in time – the winning team had turned in almost an hour before the end of the game. Full results for all teams are available on the MouseAdventure website. This game had a total of 335 possible points. 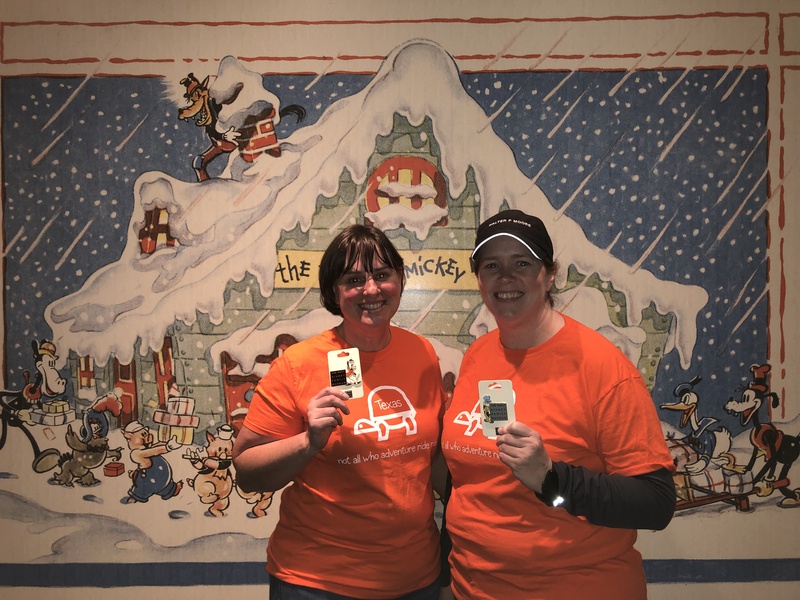 Thank you first and foremost to Emily Vann of The Walt Disney Family Museum for coordinating all the logistics for such a fantastic weekend and for providing prizes to the winners on each day. Thank you also to our MouseAdventure crew volunteer Amanda. And finally, thank you to our teams; your support and enjoyment of our games makes for such an amazing experience.